The decorative finishings you choose when completing your basement renovations are just as important as the layout and design. An important thing to consider when planning your new space is characteristic low basement ceilings. To combat the enclosing feeling that this architecture can create, keep wall colors dark and ceiling paint light to draw the eye upwards and give the illusion of greater height. Don’t forget that basement paint choices should reflect the purpose of the room with darker color palettes chosen for home theatres or man caves, and bold vibrant hues selected for fun bar areas and game rooms. When choosing finishings such as cabinetry, light fixtures and floor coverings keep in mind contemporary design ideas and the room’s purpose. When beginning your home makeover, first browse our latest online collections of finished basement images and renovation before and after pics to discover the potential of your space. Whether you are creating an area distinct from the rest of the home or one that blends well with your existing design schemes, be sure to incorporate the latest contemporary decorating ideas to ensure that your basement is trendy and modern. Decide what uses and activities you plan for the new space then check out our best basement ideas to make those dreams a reality. If you wish to expand on the usable square footage of your home but want to save money and property, consider investing in diy basement renovations. For example, homeowners often complain about the need for more bedrooms and baths. There are a wide variety of unique elements to incorporate in your basement remodel to ensure that the space is functional as well as entertaining. When planning your downstairs makeover, do not forget to include important features such as a small basement bathroom or kitchenette. If you are working under space constraints get creative with the floor plan. For example, utilize that awkward angled area underneath basement stairs to tuck away a small powder room or install a miniature kitchen space. Our favorite small kitchen ideas for a basement incorporate essential elements like stoves, microwaves and bar sinks as well as luxury features such as designer mini fridges and wine coolers. 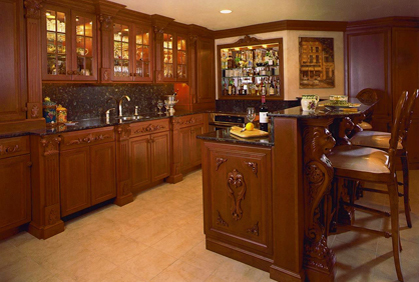 Be sure to use high quality fixtures and cabinetry to blend well with the rest of your home. Walkout basement designs become especially versatile by adding features such as a full bathroom and kitchen, creating an isolated downstairs apartment for your teen or even additional renters. Every great home needs a cool living space for lounging and entertaining. 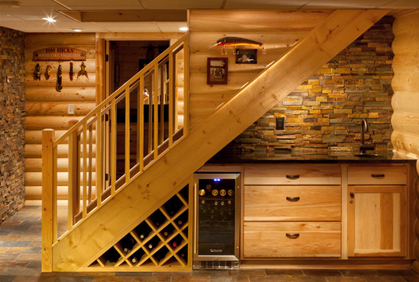 Transform your dark and dingy unfinished basement into the ultimate man cave ideas that will make all of your guests immediately green with envy. 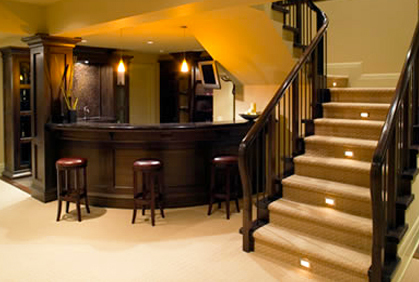 Small basement designs are the perfect place to build a home theatre or dedicated game room and entertaining space. The expansive open layout generally found in basements floor plans make them an incredibly versatile space perfect to transform into a fun bonus room. 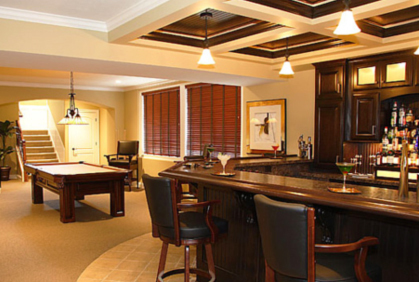 To create the ultimate entertaining space for watching sports games or holding large gatherings, try to incorporate a wet bar in basement ideas. 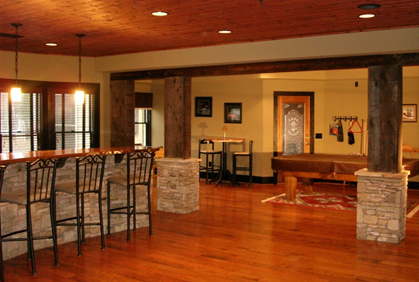 The unique features available for finishing your basement bar are endless, including professional grade beer taps, glassware racks and artistic bar tops. Create a wonderful and fun bonus space in that overlooked basement to increase the entertainment factor and retail value of your home. These versatile spaces can be transformed into a wide variety of rooms from a basement apartment or fantastic game room to a great second living room and home theatre. Our ideas for finishing a basement will give you great inspiration for planning your makeover and ensure that you are knowledgeable of the latest trends and features in bonus room design. Don’t forget to complete your design with the best home interior decorating styles to ensure that the finished space looks contemporary and blends well with the existing décor scheme in rest of the house. Whether you want to reclaim that unused living space or need to update your boring finished downstairs area, our small basement ideas and diy home improvement plans will help you create the unique room of your dreams. With our great collection of 2020 basement design trends, diy tips and fantastic space maximizing solutions, finishing your downstairs has never been easier.